Diet: Primarily feeds on insects, especially aquatic insects, but also terrestrial insects such as grasshoppers and beetles. Also will feed on small crustaceans, mollusks, worms, small amphibians, and occasionally small fish. Behavior: Prefers shallow water along shorelines for foraging, both by probing with its bill in the mud and water, and by picking food items from the water’s surface. 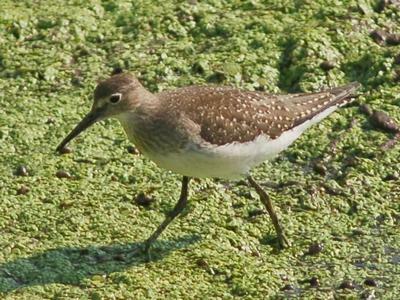 These Solitary birds will occasionally stir up the stream or lake bottom with their feet to reveal food items. They are Non-breeders in South Dakota. Song: A crisp, rising pee-EET flight call. Alarm call is a sharp, short kleek. Migration: Summers throughout much of Canada and Alaska. Winters in South America.